Where did you get Eidam?? I used Monterey Jack since I didn’t find Eidam. Here some people find Edam which is similar to Eidam. I actually like Monterey Jack the most. 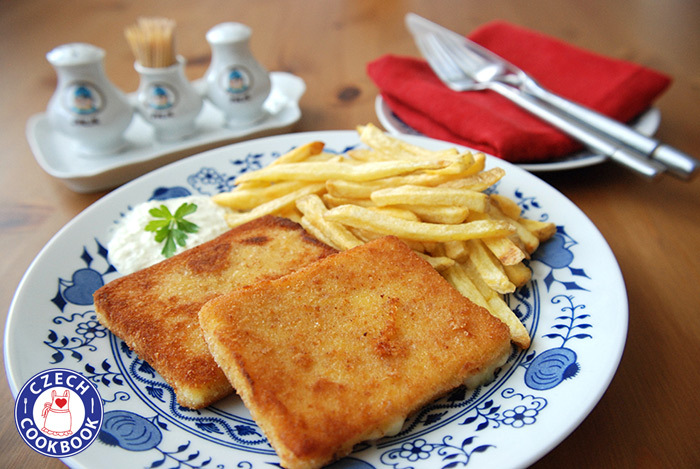 A few weeks ago I made the breaded fried cheese along with tartar sauce and french fries. My husband gobbled up several (and I mean several) pieces. He really misses the czech food his dad use to make and was thrilled when I began making your recipes. The ones I have made so far are so yummy! Chtela bych poprosit o recept na knedliky. Hlavne na pouzite ingredience. V Cechach je delame z hrube mouky a zde ? prosim tedy o radu…. zmrazeni, atd. znam. Jinak skutecne recepty jsou skvele . Znam je a v Americe varim denne, ale casto nevim, jake zde pouzit materialy /nazvy/. Moc dekuji! Hello Alena! I just came across your website through your YouTube channel yesterday. I used your “Šunková pomazánka” recipe for our New Year’s Eve chlebicky and my husband (from Prague) absolutely loved it. I typically just put butter and then toppings, but wanted to make it extra special this year – so glad I found your site! Tonight I’m trying this recipe – Smažený sir – as it’s one of my favorite Czech dishes – after Svíčková of course 🙂 We return to Praha each Christmas and it’s the first thing I order. Thank you for sharing your recipes! šťastný nový rok! Hi Monica! Glad to hear your husband enjoyed the spread. 🙂 I hope you enjoyed Smazeny syr as well. 🙂 That is wonderful you can visit Prague every Christmas. 🙂 Stastny novy rok! I went to CZ first time a month ago and fell in love with the food. I’m so thankful for your English/American translations so I can cook for my Czech boyfriend (and myself!). this was our son’s favorite meal in Czech Republic. He was then the brave 12 yr old and was not interested in his parents’ country. Now, so many years later, he is remembering the trip fondly and wishing to go back. At your expense, son! Thanks so much for this! I’m in Northern California and found Edam cheese at Sprouts grocery store! Wow! How amazing! Thank you for letting me know. Wish to have Sprouts closer. But will keep an eye on it if I see Sprouts. I’m looking for your tarter sauce recipe. In your video you said it would be available but I guess I’m not looking in the right spot. I just returned from 4 days in Prague. if I’d know about this then I would have tried it for sure!!!! It is here on my blog. Just do search for Tartar sauce. just came back from germany….one of the stops was prague….first night there had blue cheese fried cheese ….oh my gosh so good!…. Glad to hear you enjoyed it! It is delicious!